From Tamashii Nations. 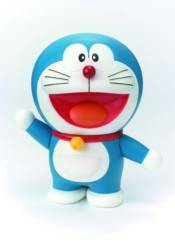 From FiguartsZERO comes the internationally popular robot-cat Doraemon in a collectible statue figure series complete with display stage! You can create various facial expressions with interchangeable parts and pose them in many ways with movable arms. This adorable set comes with interchangeable eyes (left and right) and interchangeable facial expression part. GUDETAMA 6 1/2-INCH POUCH GUDETAMA GUDETAMA 01 PLUSH 5"
LOVE LIVE SUNSHINE FIGURE RISE TAKAMI CHIKA BUST MODEL KIT LOVELIVE! SCHOOL IDOL FESTIVAL FIGFIX MAKI NISHIKINO: CHEERLEADER VER. MENSHDGE TECHNICAL PVC STATUE NO 16 METAL GEAR SOLID V VENOM SNAKE METAL ACTION MAZINGER Z BODY LTD. ED.